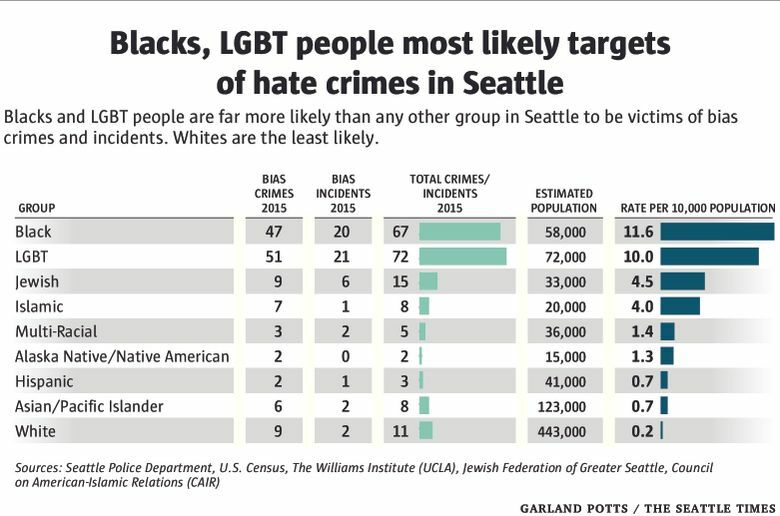 Black and LGBT people are more than twice as likely as any other group to be targets of hate crimes in Seattle, data analysis shows. The massacre at an Orlando, Fla., gay nightclub on June 12 wasn’t just the deadliest mass shooting in modern U.S. history — it was also the worst hate crime. And while the magnitude of that attack was unprecedented, the choice of target — LGBT people — is sadly common. Seattle is a famously accepting city, but we’re not immune. In 2015, 72 hate crimes and incidents against LGBT people were reported to the Seattle Police Department — double the number from the previous year. The number of such crimes against blacks — 67 — more than doubled. There were a total of 208 hate crimes and incidents reported in 2015, up from 126 in 2014. My analysis shows that, based on the size of their local populations, both black and LGBT people were more than twice as likely to be victims of a hate crime or incident in Seattle as any other group — and at least 50 times more likely to be targeted than whites. In 2015, blacks were victims of hate crimes and incidents at a rate of 11.6 per 10,000 city residents. For the overall population, the rate was 3 per 10,000. While blacks are the most likely group to be victims of a hate crime in Seattle, this is not the case nationally. A New York Times analysis of 2014 FBI data found that LGBT people are the most likely targets of hate crimes in America — and twice as likely to be targets as black people are. The rate that LGBT people in Seattle were victims of hate crimes and incidents was 10 per 10,000 in 2015. According to Lt. Mike Kebba, who compiles bias-crime statistics for the SPD, a number of factors are weighed to determine if a crime is motivated by hate: the offender’s words and actions, evidence left at the scene, testimony of witnesses and the criminal history of the offender. Kebba feels that the increase in Seattle’s hate-crime numbers could be due, at least in part, to efforts by the SPD to make sure victims report them when they do happen. “We are very encouraging at community meetings and through outreach efforts,” he said. The SPD has liaisons to forge relationships with various communities in the city, and the department recently appointed a bias-crime coordinator who works full time on those investigations. This is not the case in many other cities and towns, where hate crimes may be more likely to go unreported. A recent Associated Press report found that more than 2,700 police agencies around the nation never categorize any hate crimes as such. Kebba says some communities may be less inclined than others to report when they are victims of a hate crime, particularly those who are newly arrived in the U.S.: “I think language can be a barrier, and cultural difference — like the way they perceive police in their home country can sometimes be an initial barrier … We need to work through those issues,” he said. Hate crimes and incidents happen in all parts of the city, but about a third are reported on Capitol Hill, where both straight and gay people party. “Sometimes it’s just a matter of them wandering into your world — they see you holding hands with your boyfriend, or whatever, and they take offense to that,” Kebba said.